Toys, Toys, Toys... The question is "what does baby really need," or "what are some of the best things for baby?" Here's what I have learned on this journey of motherhood, A few quality items, really do go a long way. When I had my first son at (ahem)18, I bought everything out there, everything he pointed to or played with. I didn't stop to think what he was actually going to get out of playing with it. Was he learning anything from this toy? Now, I have learned a lot over the years. I've learned that the more stuff the children have, the more they are bored. Does that make sense at all? It's true, think about it. There are to many choices and they have a hard time deciding. Plus the more stuff you have the more it makes for a cluttered space. Doesn't that sound great? That is why I decided to put this list together, It is for the mom's that are budget conscience, but still want the best. So here are my Top 10 items for baby. Click on the picture for purchasing details. These wooden rattles and teethers are perfect for this age and they are organic. Water blocks, babies love to hold them, look at the colors, stack them. Older children can use these to learn there colors and build. Also perfect for light tables. Babies love to look at themselves in mirror's, so what better than to practice balancing at the same time. (smile) Plus this bar/mirror set is so cute. Books are so important for a child's development, and being able to get them for themselves makes it that much better. This natural bookshelf is perfect size for your child from 6 months to 10 years. It is well worth the cost to have a life-long reader. I hope you enjoyed seeing and learning about some of these Montessori items for baby. Please don't feel that I think these are the only great things for babies. Thankfully their are lots of wonderful items out there for baby. 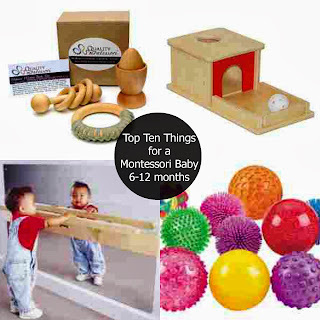 These are just a few items that I feel are a huge asset to the Montessori home. If you enjoyed reading this, I would love for you to join me at Natural Beach Living where I blog regularly about homeschooling, family life, kids activities, and so much more. You also might want to check out my Pinterest boards here for ideas with babies and Montessori living.